Hot diggity dog, the most celebrated hot dogs are coming to town! Papaya King, New York’s reigning hot dog emporium since 1932, will open its first-ever Las Vegas location at Harmon Square, across from the Hard Rock Hotel. Set to open this fall, guests will soon be able to indulge in the 84-year-old restaurant’s world-famous snappy franks, tropical drinks and more, here in Sin City. Combining freshness, quality, flavor and fun, Papaya King invites guests to get treated like royalty and enjoy a taste of New York City, all in a warm and inviting atmosphere. The restaurant will feature a 1,558-square-foot space (nearly three times larger than the New York locations), allowing for up to 54 guests, complete with dine-in and take out options. Guests will be transported to the restaurant’s New York-inspired environment with its eclectic tropical design and walk-up counter ordering system to offer a fast casual feel. The restaurant will offer its iconic, special recipe franks (featuring 100 percent all-beef, made in New York City, and shipped to Las Vegas) and tropical drinks to Las Vegans and tourists alike. Guests will be able to choose from a wide-variety menu including eight classic combos, over a dozen specialty franks, along with a choice of individual items such as franks, chicken and of course, its crown jewel offerings. Highlights include the Classic (kraut, NY onions or relish); Homerun (kraut and NY onions); Pig N Da Blanket (bacon, sautéed peppers, sautéed onions, and cheddar cheese sauce); Side on Top (chili, cheddar cheese sauce, and curly fries); Upper East (pastrami, kraut and pickle chips) and much more. To complement Papaya King’s famous frankfurters, wash it down with their world-renowned tropical drinks and smoothies. Tropical drinks include the original papaya, mango, coconut, banana and strawberry, all since 1932 – 84 years of tropical deliciousness! Signature smoothies include the Banana Berry (banana and strawberry); Papaya Pride (papaya, pineapple, and strawberry); and Pineapple Surprise (banana, kiwi, and pineapple); to name a few. Papaya King will be located at 4505 Paradise Road, Suite 350, at the corner of Harmon and Paradise. For more information, visit www.papayaking.com. 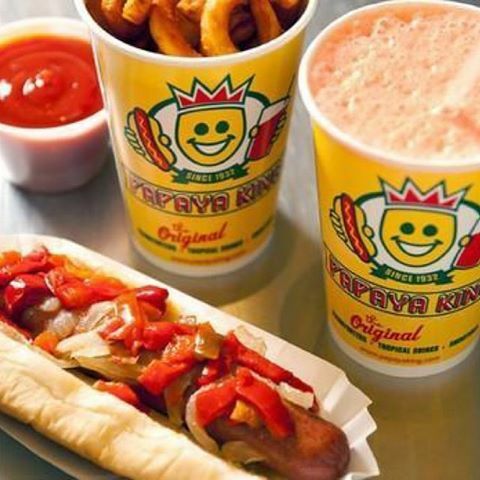 Papaya King is a fast casual restaurant concept that specializes in one-of-a-kind franks and tropical drinks. In addition, the restaurant serves crispy curly fries, onion rings, fried pickles, fried Oreos, fried Twinkies, tater tots, knishes, chicken sandwiches and corn dogs. Julia Child said Papaya King serves the “best hot dogs in New York” and Martha Stewart named it one of her “guilty pleasures.” The original Papaya King opened in 1932 on the corner of 86th St. and Third Ave. on the Upper East Side of Manhattan, and now features three locations in New York City, with a fourth expected to arrive in Las Vegas in 2016. More information is available at www.papayaking.com.